Natural habitat areas exhibit similar abundances and diversity of herpetofauna as citrus orchards and reclaimed orchard forests in Stann Creek, Belize, reports a comparative study by researchers Russell Gray and Dr. Colin Strine of Suranaree University of Technology (SUT), Thailand. The scientists utilized several drift-fence arrays equipped with double-funnel traps to monitor and compare reptile and amphibian communities in a lowland broadleaf forest, a lime orchard and a reclaimed citrus orchard at the Toucan Ridge Ecology and Education Society (TREES) field station. Their study was recently published in the open-access journal ZooKeys. Often referred to as Central America’s “hidden gem” for its abundance of undisturbed rainforests and natural beauty, Belize has a long-standing record for vigorously protecting and maintaining their forested areas. However, just as in any other developing country, its primary sector is expanding with agricultural land clearings becoming more frequent with newly established properties. Approximately midway through the study (June – September 2016), the site was hit by Hurricane Earl, a Category 1 hurricane. The hurricane-force winds altered the canopy cover significantly over the forested study sites, due to felled trees and broken branches. Surprisingly enough, the herpetofauna remained relatively unchanged in the aftermath of Earl. The phenomenon revealed that not only were herpetofaunal communities lacking sensitivity to anthropogenic changes in the area, but also to extreme weather events, even though these had affected most of the standing vegetation. Amongst other notable scientific discoveries reported during the project were two new accounts of the Petén Centipede Snake (Tantilla hendersoni), one of which was the first documented male of the species. This secretive snake had only been documented once prior to the study and is the only endemic snake species to Belize. 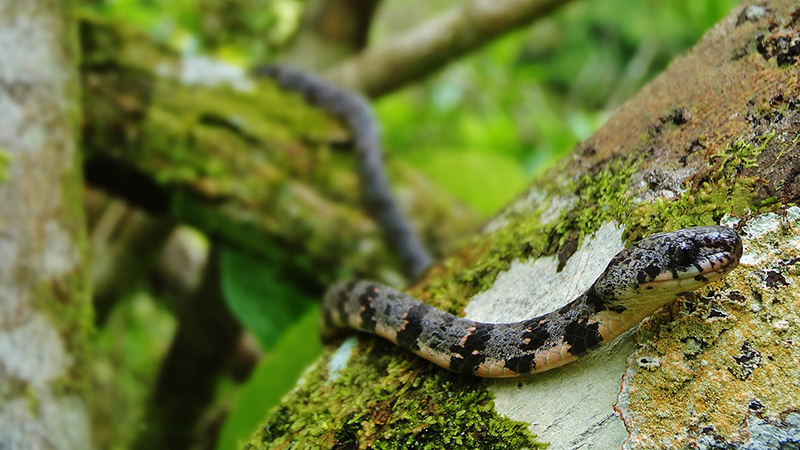 Further noteworthy instances were two range extensions for relatively data deficient species – one for the Doflein’s Salamander (Bolitoglossa dofleini) and another for the Ringneck Coffee Snake (Ninia diademata). Besides providing important data on herpetofauna assemblages in various disturbed and undisturbed habitats in Belize, the research identifies future conservation methods to be considered. The study serves as new evidence that as long as agricultural areas remain surrounded with natural habitat buffers, they have little effect on herpetofaunal communities. Replicates of this study are encouraged by the authors and can be utilized as a feasible and efficient way to monitor reptiles and amphibians in Belize. Although Belize still preserves a considerable amount of intact forest cover, there are several on-going conservation concerns. Besides agricultural land clearings, there are constant struggles with xate poachers, or “Xateros”, on the Guatemalan border, as well as illegal logging activities and illegal off-season hunting. Unfortunately, reptiles and amphibians have been understudied in comparison to other vertebrates and government action is rarely enforced on their conservation throughout the Neotropics. A striking example of this relates to the only critically endangered reptile in Belize – the Hickatee turtle (Dermatemys mawii). Although the species is likely to become extinct, it is still traditionally collected for its culinary value, while its hunting is banned only in May. In conclusion, the authors note that it is crucial to pay close attention to anthropogenic activity and the potential repercussions it may have on native species. With extensive and active efforts to study Mesoamerican herpetofauna, proper conservation efforts can be implemented and focused.